The winners of each month's Back Stage Actors' Reels and Stand-Up/Improv Channels will be showcased on BackStage.com, which reaches an audience of hundreds of thousands of actors and entertainment-industry professionals. The winning videos will be shown on Back Stage alongside the performer's professional bio, profile, and/or quotes. Awarded to the highest-ranking artist within each monthly Back Stage Actors' and Stand-Up/Improv Channels. 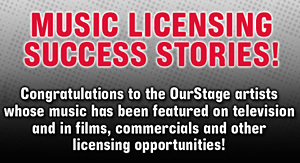 Prizes awarded according to OurStage's monthly competition terms and conditions.